Turnbull hanging by a thread—where now for the refugee campaign? In the last weeks of the federal election, Turnbull, increasingly desperate for votes, played the refugee card. But it didn’t work. Rather than secure the election, the Liberals lost seats by the bucketload. First came Immigration Minister Dutton’s scandalous effort to whip up anti-refugee sentiment by declaring that refugees were illiterate and innumerate and they were taking Aussie jobs. Then miraculously, in the middle of the election campaign, the Channel Nine program A Current Affair (ACA) got permission to go to Nauru. They called their segment, “A story that will stun Australia,” but it was predictably a stunning, selective white-wash. However, despite their efforts, the swing against Dutton was double the Queensland average. As Solidarity goes to press, a Turnbull government is just hanging by a thread. The refugee campaign needs to go on the front foot. Both major parties are committed to turning back asylum boats and maintaining offshore detention. Yet the election has opened up cracks among Labor candidates. The Australian claims that there are 50 candidates or sitting members who have opposed Labor’s offshore detention policies in some way—many of them were part of the “Let Them Stay” campaign. And Australia’s detention regime is fraying. Half of the offshore detention system is finished—Manus Island will close. The next sitting of the PNG Supreme Court is 15 July. But the court has already ruled that the Manus detention centre is unlawful. No more asylum seekers can be sent to Manus; the only question is, where are the people there going to go? When Manus prisoner and Iranian refugee, Behrouz Boochani, sent a Q&A video question to Malcolm Turnbull asking why he is still in the Manus prison, “What is my crime?” Turnbull had no answer. He pathetically repeated the lie that refugees on Manus Island or Nauru are the responsibility of PNG and Nauru governments. The government has spent the months since the 26 April Supreme Court decision pretending that the decision has nothing to do with it—but Manus has to close and Australian High Commission officials are at every PNG court hearing. Action in Australia is going to be needed to press the demand for all those on Manus and Nauru to be brought to Australia. Meanwhile the protests continue on Nauru—108 days and counting as Solidarity goes to press. The pressure is also mounting there. Early in the election campaign, Labor leader Bill Shorten said, if he was elected Prime Minister, he would send shadow immigration minister, Richard Marles, “to try to strike an urgent deal with the United Nations High Commissioner for Refugees about a possible third country”. Later, when New Zealand repeated its willingness to take 150 refugees a year from Australia, Shorten didn’t rule it out. This is posturing by Labor; no third country is going to take refugees who are Australia’s responsibility. But the shift in rhetoric and the 50 “dissenting” candidates are encouraging indications that the refugee campaign has had a real impact on the bi-partisan support for offshore processing. It is five months since the High Court ruled that offshore detention on Nauru was lawful. But despite the ruling, and the threats from the Immigration Department, none of the 267 asylum seekers who were part of that High Court case have been sent back to Nauru or Manus. That is the real measure of the strength of the campaign so far. The movement needs to press home its advantage against a severely weakened Turnbull government, and also press to open the cracks in Labor even wider. Since the February High Court case, another 60 people have been brought to Australia from Nauru and Manus Island for medical reasons. Any attempt to remove any one of the people from Manus or Nauru has to be resisted. In the lead up to the election, Turnbull’s, Dutton’s and other MPs’ offices became the focus of pickets and occupations. 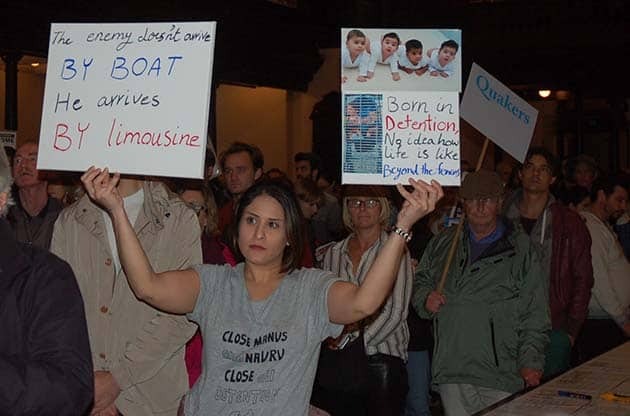 Around a thousand people attended refugee rallies in Sydney and Melbourne a couple of weeks before the election. The election has pushed back the Liberals. There is an opening for the movement to step up the pressure to end offshore detention. Rallies have been called in Sydney and Melbourne for 27 August, to tell whatever government, Liberal or Labor, to end Fortress Australia and “Bring Them Here”.